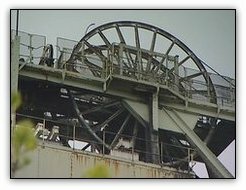 11 May 2010 - Production is to end at a Nottinghamshire colliery after almost a century. The final shift has started work at Welbeck Colliery, which dates back to 1912. Operators UK Coal earmarked the pit for closure in 2005 as it has mined its final reserves. The firm said 70 of the 410 miners will remain to recover equipment, 120 will transfer to other pits and 60 have left the industry. Workers will remain at the site, near Meden Vale, for several months to salvage equipment worth £6m and to seal off the mine. Jeff Wood, president of the Union of Democratic Mineworkers, who worked at the mine for 32 years, said: "It is quite an emotional time for the men. "There were no longer any further reserves at Welbeck that we could exploit and obviously the company have decided to pull out." UK Coal chief executive Jon Lloyd said: "This is a sad day for UK Coal, the coal industry and the communities which have had an association with Welbeck for almost a century. "But being an extractive industry, this day was an inevitability." At its height, Welbeck employed about 1,400 miners and had an annual output of around 1.5m tonnes. In its last six weeks as an operating mine, it has produced 360,000 tonnes from its last face. Thoresby is now the only remaining working mine in the county. Haworth has been mothballed and could potentially be re-opened.